AEM oak indexing is a very crucial and important concept as performance of all queries depends upon how oak has indexed the properties in back-end. I have received multiple request to write on indexing in aem as this is a very vast concept and very limited knowledge and documentation is available on internet. Because if no index is found for a specific query, then whole repository will be traversed, which is a very costly operation and might result in temporary freeze/hang of system/instance if multiple full path traversal queries are fired. In this tutorial i will try my best to describe what are the type of index available in oak and which one should be used when in aem. As oak does not index as much content by default as Jackrabbit 2 does earlier and we have to create custom index to improve performance of query. So I will also cover how to create custom lucene and property index as part of this tutorial. 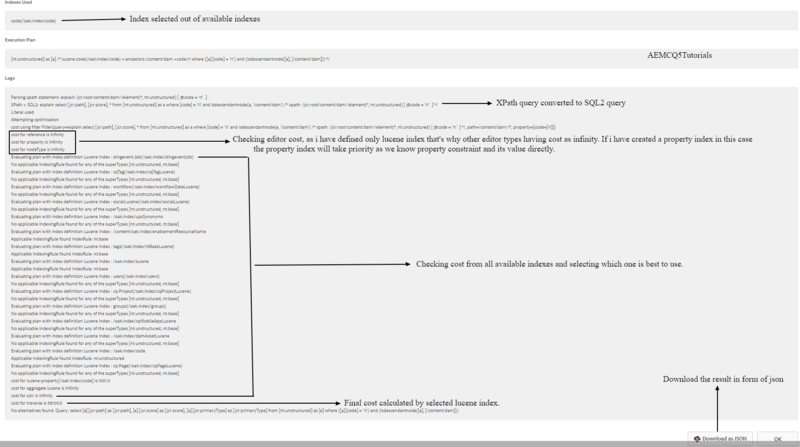 Create custom property index in aem. Note:- Out of these AEM uses only two modes synchronous Indexing and asynchronous Indexing. Ordered (Deprecated) – As ordered indexes are deprecated, so we are not going to discuss about them in this tutorial. Lets see in detail about different type of aem index provided by oak. Go to Query performance tool Tools -> Operations -> Dashboard -> Diagnosis -> Query Performance. AEM 6.1 on wards Explain query tool was made a part of product itself. For detailed level of debugging you can also install acs common explain tools https://adobe-consulting-services.github.io/acs-aem-tools/features/explain-query/index.html . But in this tutorial we are going to use only those features that comes out of the box with product. When you open query performance tool. First tab will show you the list of slow performing queries, second tab shows list of popular queries. These tabs helps in identifying our slow and most popular queries, so that we can further optimize them if required. Third tab is Explain query Tab, this is the tab in which we are interested. The language drop-down provides support for running queries in 3 different languages JCR-SQL2, SQL and XPath, Personally i prefer running queries in form of xpath as i get xpath query syntax easily from querybuilder tool. In query tab, enter you query that you want to analyze. 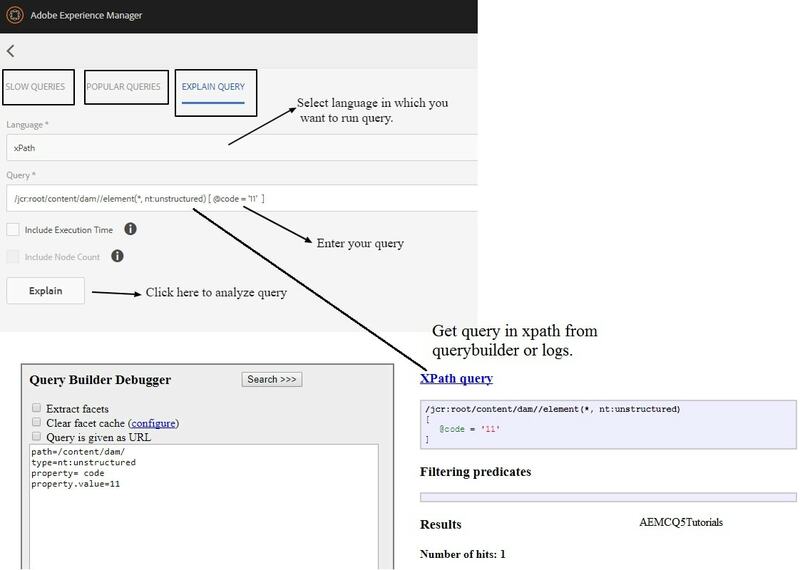 Click on Explain button to analyze the query. Lets understand this scenario with a use case. I want to get all nodes under /content/dam which is having property code=11 and primaryType is nt:unstructured. First Scenario:- I have created only lucene index for property code. Note:- If cost is infinity , it means that the given index is never used. In this case property index will be picked as we know the property constraint and its value. Note:– Lucene index works on node type, if no property index is available and nodetype matches then it will use lucene index. As it will return lower cost instead of full repository traversal. You can use aggregation if you want to search on nested nodes. Enter name of PropertyIndex node( you can give any name but its good to keep it meaningful means it should tell the purpose of this node ), and enter node type to oak:QueryIndexDefinition. Click save all and save your changes. That’s it you have successfully created a custom property index. As i said It’s very simple isn’t it. One thing required is the knowledge when and where which type of index is required for optimizing aem queries. Note:- It is recommended to index one property per index although propertyNames is an array. Because if multiple properties are indexed within one index, then the index contains all nodes that has either one of the properties, which can make the query less efficient. valuePattern (String) : A regular expression of all indexed values. The index is used for equality conditions where the value matches the pattern, and for “in(…)” queries where all values match the pattern. The index is not used for “like” conditions. Since Oak version 1.7.2 (OAK-4637). valueExcludedPrefixes: The index is used for equality conditions where the value does not start with the given prefix, and the prefix does not start with the value, similarly for “in(…)” conditions, and similarly for “like” conditions. and for “in(…)” queries where all values match the pattern. Since Oak version 1.7.2 (OAK-4637). valueIncludedPrefixes : The index is used for equality conditions where the value starts with the given prefix, similarly for “in(…)” conditions, and similarly for “like” conditions. Since Oak version 1.7.2 (OAK-4637). keyCount (Long): the estimated number of keys in the index, to override the cost estimation (a high key count means a lower cost and a low key count means a high cost when searching for specific keys; has no effect when searching for “is not null”). Enter name of LuceneIndex node( you can give any name but its good to keep it meaningful means it should tell the purpose of this node ), and enter node type to oak:QueryIndexDefinition. Note:- Its is recommended to create one index definition, each index definition has one index rules and under one index rules we can have multiple nodetype and properties associated with each node type on which we want to create index. Few more optional properties are available at index definition level. Refer OAK Documentation for more info. Sometimes it is useful to include the contents of descendant nodes into a single node to easier search on content that is scattered across multiple nodes. In simple words, generally lucene index only one node type, but if we want to inherit properties from its decendent nodes also on parent node we ca use aggregation. Lets understand it with a use case, consider you have created a lucene index on nodetype dam:Asset, but some of your properties resides on dam:Asset/jcr:content or dam:Asset/jcr:content/metadata/ or dam:Asset/jcr:content/metadata/* and you want them to index also in this custom lucene index only. You can achieve this by using aggregation. Right click and create a node of type nt:unstructured and name as aggregates. Create another nt:unstructured node under dam:Asset and name it as include0. Enter below properties on this node. Note:- You can have multiple node type under aggregation and each nodeType will have multiple includes based on the requirement, with incremented version include <number>. Repeat the above steps for all child nodes that you want to make part of aggregation. Like create two mode nodes with name include1 and include2 with path value as jcr:content/metadata and jcr:content/metadata/*. That’s it you have implemented aggregation on custom lucene index now properties from dam:Asset/jcr:content or dam:Asset/jcr:content/metadata/ or dam:Asset/jcr:content/metadata/* will be index on dam:Asset node. As i have said earlier aem oak indexing is a very vast topic and is very difficult to cover in a single post. That’s why i am ending this post here and will see stemming synonyms , stop words and more in follow up posts. Note:- The important part is TraversingCursor, it’s hinting that the highlighted query was not served by an index. In this example, to solve the problem we would need to create an index on the property foo. Another case is, it might happen that the TraversingCursor still serve the query if an existing index cost is higher than traversing a particular sub-tree. Note:- This is highlighting that the query is being handled by an index. ContentMirrorStoreStrategy is used only the property index. Nevertheless, the index is becoming big. more than 10000 nodes by default. The actions from here to be taken are if there’s any way to optimize the query itself or increase the threshold. In our specific example the query can be optimised by providing a specific node type and/or a path restriction. Otherwise the threshold can be configured by the system property oak.traversing.warn. See OAK-2720 for more details. In this case you should create two index one property index and one lucene index. I tried to run this use case and when you search based on property constraint property index is picked and when you want same property in full text query lucene index is picked. 3 Responses to "AEM OAK Indexing : Comprehensive Guide"
Very well explained, waiting for other continued post. Can you please explain more about ContentMirrorStoreStrategy? Very good Post. I am trying to do boost based on custom property in custom lucene index. I tried adding the custom property in the newly created index and configured both analyse and ordered and boost properties. Still it is not getting boosted. You mean to say after indexing you got same performance. ? After you did reindexing how many nodes got reindexed ? 2.Navigate to Repository folder and search for indexes. 4.Rename index folder to some other name . ( ideally we should delete it but for safer side rename it ). 5.Once done , restart AEM . 6.Index folder will create newly and AEM starts after some time . 7.After that check your performance. 8.Still you have same issue, then i might doubt on properties you used for indexing. Very well Explained. I am trying to check when the index gets updated when I update any of my content. Currently if I change anything on my page I have to manually reindex the index through index manager, so that the page with the new update is shown in my search results, otherwise it doesn’t come up.